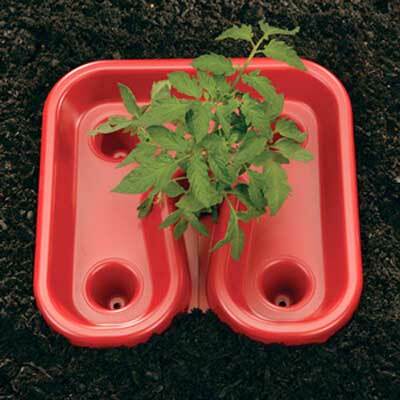 Ensure your tomatoes grow beautifully using these Gardeneer Red Tomato Enhancing Trays. These innovative trays help stimulate growth in your tomato plants, while keeping weeds and insect pests away from the soil around them. Their unique design almost fully surrounds the plant, and this pack of 12 is perfect for a full garden row. A channel and opening on each unit accommodates the stem of your existing tomato plant, while the rest of the square tray expands 12" outward around it. This covering prevents weeds from growing in that area, and can also help retain moisture for protection from drought. Four 1.75" long spikes on each tray insert into soil, and each has a small opening at its base. This allows you to fill them with slow release fertilizer, or helps water slowly reach to the root system. The red color of each tray reflects onto the plants to stimulate plant growth, and their plastic construction withstands use for many seasons. Grow lovely and hardy tomatoes with help from these Red Tomato Enhancing Trays. Made in the USA. Note: This case pack includes 12 of the Gardeneer Red Tomato Enhancing Trays.